Rated 5 out of 5 by wildweasel from Honored Healer I guess I got a big head being called Honored Healer. I've enjoyed all the Enchanted Kingdom HOG's I've completed. I would recommend this game. I guess I've always liked the Mid-Evil theme of a game. Rated 5 out of 5 by BoBeOwner from Fun Hidden Object Game With New And Different Things In It! This game was interesting to me because it involved the player making potions from items you had collected during play and then using them on major characters to save them from the evil devils lurking everywhere. This was different to me in the way the programmers got these saving actions done. Rated 5 out of 5 by skullfun from ENCHATED KINGDOM 3: ANOTHER GREAT ADDITION TO THIS SERIES WITH A DIFFERENT VIEW. When Domini developers created this series I somehow knew it would get rave reviews. Alice Carpenter the Healer is on her third journey to save the Tar Empire from a fatal illness inflicted by an Evil force known as the Shadow of Oblivion. You have been invited to once again find the cure to this mysterious disease because of your immunity and magical healing abilities using your Healer’s Kit and Diagnostic Lens. The visuals are gorgeous, with excellent color choices and special effects to polish the detailed artwork. The audio is equally captivating. The background music is appropriate for the somewhat sinister vibe of the game and story, and the voice-overs provide some very emotional context to the characters. This edition like the previous editions seems to be popular for a variety of reasons. Fans of the series have given an average 4-star rating to this series thus far thanks to the creative design team at Domini. While this edition is purely fantasy, I can't help but imagine how wonderful it would be if Alice the Honored Healer was REAL. Fans may or may not have contemplated this concept, but I have. Wouldn't it be incredible if all of the life-threatening illnesses present today in the real world could be cured by a heroic healer's gift? No more Cancer, Heart disease, HIV/Aids, ESRD which requires dialysis and a host of other potentially fatal diseases. Like many BFG game club members, I know so many people who have been affected by these catastrophic illnesses who wish to see these diseases eradicated at some point during their life-time. On that note my emotional response is simple... Thank you Domini games for creating this wonderful game that gives casual gamers hours and hours of gameplay. There may not be a cure-all for catastrophic illnesses currently but this series allows players who have loved ones who are suffering, an escape from the pain and heartache that these illnesses bring. I will continue to love this series and be hopeful for miraculous cures...Cheers! Rated 5 out of 5 by Marja67 from Good Game Pretty graphics and pretty music. Another fantasy game. Be the one to help the people get back to their real selves. Rated 5 out of 5 by thistle809 from Great fun with lots of options in every area! Based on demo only: I really love it! The mini-games are creative and imaginative with clear instructions, there is an option to play Match-3 instead of the HOS, the HOS are varied in format, the plot (storyline) is good, the dialogue is not excessive and gives us the plot as it unfolds, the music is good and the graphics are beautiful. The interactive map has an option to show where collectibles are still not found. Many mini-games have a difficulty option of "Easy" or "Hard". This game gives players lots of options and flexibility. I thoroughly enjoyed the entire demo and will be purchasing. Thank you devs for a truly enjoyable game! Rated 5 out of 5 by hazelwize16 from I ENJOYED THIS ONE! love all the characters and the storyline, especially the artwork ... lots of mini games and hos but they don't get in the way of the adventure ... so happy to see these fantasy type games ... because it's DOMINI i had to play it on the MAC side ... but that's ok w me as there were no technical difficulties ... woohoo! Rated 5 out of 5 by janmo8225 from MAGICAL Love this game especially when it allows me access to know which collectibles I need and amount. Rated 5 out of 5 by biscuitsmama from HONORED HEALER CAN YOU STOP THE SPREAD OF THIS HORRIBLE DISEASE AND SAVE THE TAR EMPIRE? This is the third game in the Enchanted Kingdom series and once again you play the game as the Tar Empire’s Honored Healer. 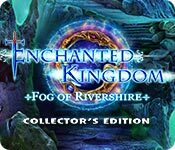 Although I enjoyed the first two games Fog of Rivershire is even better than the others. I beta tested the game months ago and I have been waiting for its release since so there was no question that this game would be an instant purchase for me. My review is based on playing the full game. I don’t like to give too many details when writing a review but tend to rely on communicating my feelings about a game rather than providing too many details that might give away too much. The Tar Empire is under attack by a terrible illness that turns those infected into monsters. Even the Medico Imperium healer assigned to the distant village of Rivershire could not withstand the effects of the disease and was locked up to prevent him from harming himself or others. Xander a warrior from the village has been stricken as well but he managed to arrive at the Medico Imperium to inform Dr. Klein of the situation and to enlist the aid of another healer. After seeing Xander, Dr. Klein believes that this is a demonic illness and because of your magic protection you are the only one capable healing the villagers and putting an end to the illness. Travel the perilous road to Rivershire and see what you can do to stop this horrible illness and to save the villagers and even the Tar Empire from the demon who is causing the disease. The graphics are really so much brighter in this game and coupled with excellent voiceovers the game provides the complete entertainment package for me. I like the game mechanics and using my Healer Kit to diagnose the illnesses I encounter and then to mix the cures. Bravo Domini for such an excellent game. Domini is another of my favorite developers and it is rare that I don’t purchase a game they create. I think that having a 56-page Strategy Guide is a good indication that this will be a nice long game. The game has an equal number of HOPS and Mini-Games. The HOPS are excellent and well-designed with a variety of styles. My favorite scenes are the list finds since I don’t care so much for the silhouette or storybook styles. For those of you who don’t want to find items in the HOP scene there is an alternate Match 3 game provided. The Mini-Games are excellent and in most of them we can choose either the easy or hard version when solving them. Some of the mini-games are a bit difficult and I found it a bit challenging to understand the objectives for a few of them. Although Domini does provide instructions for solving the mini-games they didn’t always make sense. This is when having the ability to replay the mini-games is a real benefit. Oftentimes I will go back and replay the mini-games in the extras section if I feel I didn’t do a great job of solving or skipped them the first time through. I also like to replay the ones that I really enjoy the most. Thank you Domini for including the replay in your extras for this game. If you enjoy the CE versions of a game this one includes the following extras: Collectibles include 15 Eggs, 15 Medallions, and 76 Coins to find and 26 Achievements to earn. Other extras include 10 Wallpapers, 10 Concept Art, 5 Music Tracks, 17 HOPS and 17 Mini-Games to replay, a Magic Laboratory, Medico Imperium, a Bonus Chapter, and a 56-Page Strategy Guide. I love this game! The Fog of Rivershire is so much better that the two previous games in the series and the scenes are so much more colorful and much lighter than in those games. The storyline is intriguing and is well-told. 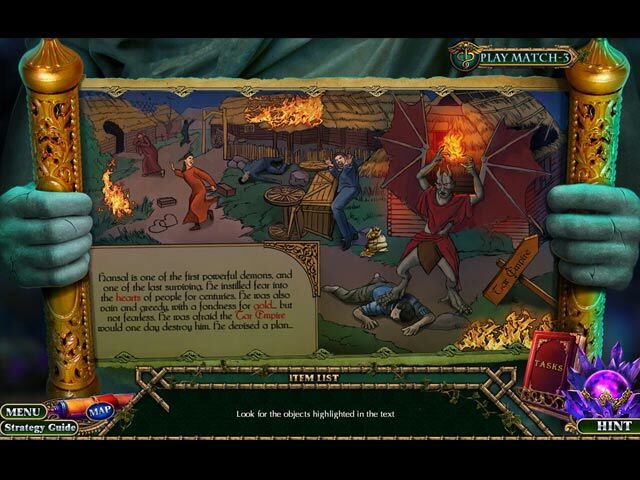 Even though there is an evil demon in the game I don’t find him as objectionable because the premise of the Enchanted Kingdom games is based on the struggles of the white magicians versus the dark magicians. In the first games we learned the history of the Tar Empire where all dark magic was defeated and banished from the kingdom and this game follows along that storyline. In spite of the bad guy it is an excellent game where I get to diagnose my patients and prescribe the healing medications they will need. Of course I must find the ingredients and then concoct the cures. 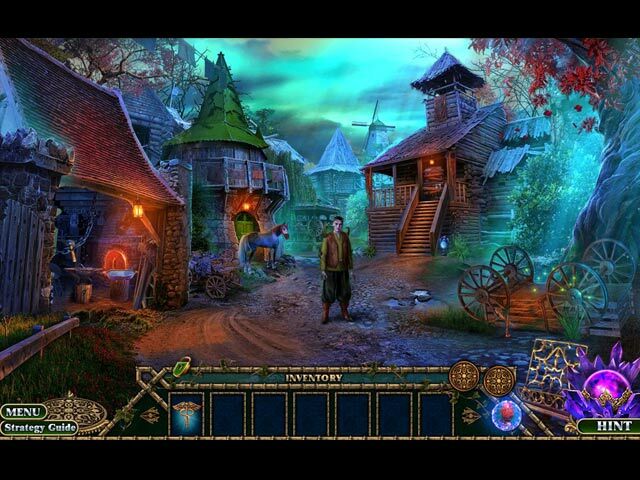 I tend to love fantasy games and the Enchanted Kingdom games by Domini are terrific and very entertaining. I have no hesitation in giving this game 5-stars and would rate it higher if that was possible. As always I recommend that you try the game to see if it is one you will enjoy. Happy Gaming!! Rated 5 out of 5 by sunnyglow from A GAME WHICH PROVES THAT “BRAIN FOG” CAN CREATE A MONSTER REVIEW BASED ON THE ENTIRE GAME – Time: 5 Hours 5 Chapters Plus a Bonus Chapter – Strategy Guide: 56 Pages OVERVIEW: Honored Healer! Grab your healing kit - you are off to the green fog infested town of Rivershire in another outstanding game by the puzzlemeisters, Domini! You will be battling the resurgence of a demonic infection hiding within this fog, causing those infected to turn into monsters. Of course, behind this epidemic is an evildoer. BFG is “breaking out in a rash” of games this week involved with alchemy. You will be collecting supplies to create medicines and potions. This game should appeal to those who love this series, medical staff or those aspiring to those professions. The main game kept me engaged. Be warned! This game is long and the bonus chapter is as well. This is not my favorite series from this developer, but even the mediocre games from Domini are better than the best games by many developers on this site. My only complaint is that there is a great deal of back-and-forth action to collect items to create the remedies. Nevertheless, this game demonstrates the same outstanding craftsmanship by Domini in providing excellent puzzles and decent HOP scenes. I purchased this game because Domini always provides those extras (which no other developer provides) which make the game well worth the investment. They are my favorite developer on the BFG site and my overall second favorite for HOP games. MECHANICS AND GIMMICKS: The story is similar as those from the previous games within the series. Some disease has you out and about to discover the cause and provide a cure all while defeating some evildoer behind the epidemic. The game is beautifully illustrated as usual for Domini. You get two gimmicky devices. One is a special lens which allows you to diagnose the seven (7) infected individuals you encounter in your travels. At the end of your diagnosis you receive a grocery list of supplies you will need to forage in the area to create the medicine. You will then need to place those supplies into a modified type of distiller in proper sequence to create that medication. I did find this activity somewhat tedious, however. I found that placing the items in the correct location on the distiller to be illogical. For me, I discovered the proper locations by trial and error. EXTRAS: Domini provides a plethora of extras within their games. There are three (3) collectibles which are fifteen (15) eggs, fifteen (15) medallions, and seventy-six (76) coins. I found all easy to locate within the scenes. The inventory bar indicates if there are any of these items within the scene as well. With the collected coins, you purchase items for your “laboratory.” There are also lots of achievements to earn, twenty-six (26) in total. The inventory is interactive requiring assembly and manipulation of the items. You can replay seventeen (17) HOP scenes and seventeen (17) puzzles. BONUS CHAPTER: This story is somewhat different from the main game. In this chapter you play the Royal Magician to the king. In yet another demon attack, his son, the prince is kidnapped by the demons and you must save him. I have not finished this chapter; however, the activities are similar with those within the main game. The player continues to locate collectibles. HOP SCENES: There are twenty (20) scenes within this game. The scenes are ones seen in other games. They include lists of items, storybook scenes, and silhouette scenes. The scenes are somewhat interactive. There are no unusual nor extremely creative scenes however. They are not as creative or well-designed as the puzzles, but they are decent. My favorite was a scene within the main game in which you must search for items and place them back into their proper place. You have the option to play a thematic Match-3 instead of the scene. PUZZLES: There are twenty-seven (27) puzzles within the game. Domini shines in this area and the puzzles are the best feature of the game. Unlike most other developers, this developer allows you to have the option to solve those puzzles in either a casual or hard mode. There is a nice variety of puzzles as well. Below is a sampling of puzzles within the game AFTER THE DEMO: SPOILERS: THESE ARE A SAMPLING OF PUZZLES AFTER THE DEMO: MOST HAVE A CHOICE BETWEEN A CASUAL OR HARD MODE: A. You’re not just a number! Connection puzzle. Connect adjacent stones with lines based on the number on each stone. Each stone should have the exact number of lines emanating from it as indicated on the stone. B. I’m on fire! Connect the dots. 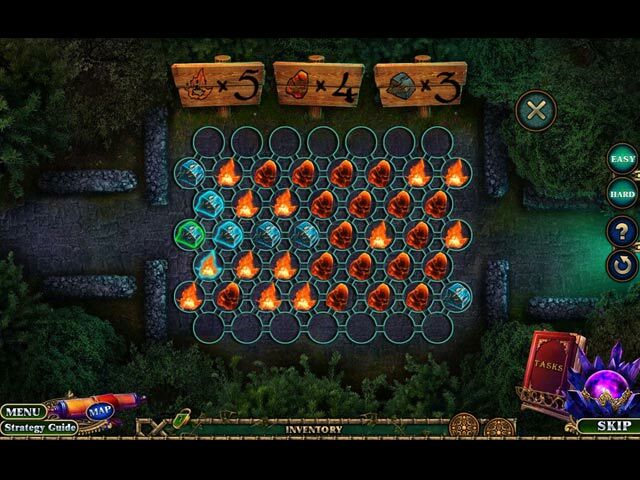 Connect all dots in a fiery scene without retracing the lines between them. C. Nice book series you have Domini! Switch puzzle. Switch books to create an image on the spines of the book. D. A Pretty in Pink Ball. Maze puzzle. Move arrows on a grid of blocks so that a pink ball can go through every block within the grid before it exits the grid. The hard level has blockers in the path. E. Become “beady” eyed. Alignment puzzle. Move six (6) rods with beads with symbols upon them so that when aligned properly, every symbol is highlighted at the bottom of the screen. F. Skulduggery! Slider puzzle. Slide a skull through a grid with cells so that each cell is visited by the skull without retracing steps. The hard version has blockers to create more paths for the skull to visit. G. AI will never replace humans! Outsmart the computer. Play the computer as you try to get more of your colored stones on the board than the computer. When you move next to computer’s colored stones, you change them to your color. Play until all squares are filled. H. Let’s get together! Combination puzzle. For three rows of symbols, switch the top and bottom rows of symbols so, when combined, creates the symbol in the middle. I. Triangulation! Rotating tiles puzzle. Create a path by rotating triangular tiles so that an orb can move from top to bottom of the path. J. Can you “spell” that? Maze puzzle. Lead a token to one end of a maze to the other by creating a path consisting of blocks with patterns upon them. You must pass through a specific number of each of those blocks before you reach the end. To make it more interesting you will be trapped within some of these blocks and must use one of three (3) spells to get out of the trap. Each spell can only be used once.